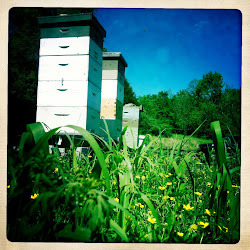 Recently I was dropping off a nuc to a great new beekeeper and we got to talking about smoking your beehives. The classic image of a beekeeper and his smoker has been around since Langstroth modernized beekeeping at the end of the 1800's. The dirty (or clean) little secret is you don't always need a smoker when working your bees. Sure, it has its advantages but I'd say I pull it out about 1 in 10 trips to the bee yard. Why choke your bees out every time you say hello? Pretty soon they'll realize like Pavlov's dogs that every time they see you, it's not going to be fun. I don't like breathing it in. It can shut down the queen laying for 24-48 hours. It can make the honey smell and taste smokey. It brings more attention to you and the location of your hives. You don't need it when capturing swarms or working nucs. When I have a strong defensive colony sitting on a lot of honey that I need to quickly calm down. When I have alarm pheromone on my hands or clothes and I want to cover it up. When I'm cutting a beehive out of a structure that's been there a long time. You know that feeling of agitation you get when you're outside on the patio at a great restaurant and someone lights up a cigarette at the table next to you? You tolerate it, but you scowl at them and eventually if the wind changes and it gets bad enough you snap. Well with the smoker, it's like you're now sitting at the same table with the wind in your face. How's that relaxing? Consider this anger management training. Leave the smoker in the truck.